Lechenaultia biloba is an Australian native plant where it is grown for its brilliant and colorful flowers. Though not found in common cultivation, the plant makes an excellent choice for rock gardens and landscape designs in sandy soil. As an ornamental plant, Lechenaultia biloba offers attractive flowers of blue, yellow, red and orange colors. 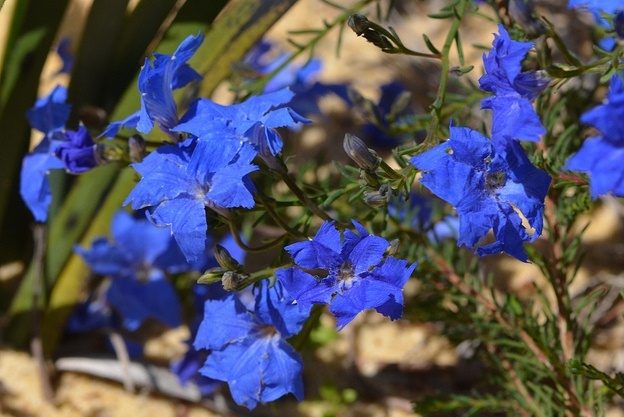 Since it comes from Western Australia, the plant is quite capable of enduring spells of drought and neglect. Gardeners can use Lechenaultia biloba as an ornamental dwarf shrub that can be easily pruned to keep it in shape. It makes an excellent choice for growing in containers or along pathways. When not in bloom, Lechenaultia biloba looks attractive because of its grey-green fleshy leaves. The plant can be propagated from cuttings. For successful cultivation, it should be provided with bright sunlight and moderate watering in a well-drained soil. Lechenaultia biloba is commonly known as Blue Lechenaultia.